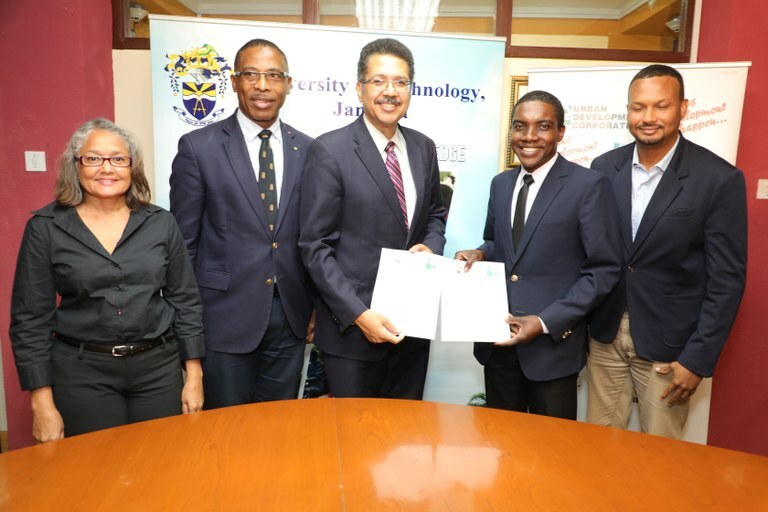 UTech, Jamaica Signs MoU with UDC — UTech, Ja. Prof. Stephen Vasciannie, CD, (left), President, University of Technology, Jamaica and Dr. Damion Graham, Chief Executive Officer, Urban Development Cooperation (UDC) display a copy of the signed Memorandum of Understanding between both entities following a signing ceremony held on Monday, February 12, 2018 at the University’s Papine campus. The University of Technology, Jamaica (UTech, Ja.) through its Faculty of The Built Environment on Monday, February 12, 2018 signed a formal partnership with the Urban Development Corporation (UDC). The five-year agreement has been forged to facilitate cooperation and sharing of information on architecture, urban design, urban planning and physical development. The MoU will also facilitate sharing of expertise on technical services including but not limited to staff and faculty exchange, student internships at the UDC, collaborative research projects and technology initiatives, income-generating projects, resource sharing, public education and joint publications. CEO, UDC, Dr. Damion Graham stated that the Cooperation is establishing a joint collaboration committee to enable greater coordination of the proposed activities and opportunities under the MoU in support of the respective mandates of each institution. Commending UTech, Jamaica on its recent accreditation of its engineering programmes, Dr. Graham remarked that he welcomes the partnership with the University not just in architectural projects but also in engineering, adding that the UDC is searching for home-grown talent in Industrial Engineering. “We have a number of parks and facilities that require logisticians and persons who fit in that space,” he said. Dr. Garfield Young, Dean of the Faculty of The Built Environment underscored the timeliness of the formal agreement with the UDC, noting that the faculty is in the processing of finalizing an MPhil and PhD programme in the Built Environment which will benefit from collaboration in applied research. Dr. Young also pointed to the opportunities for UTech, Jamaica and the UDC to collaborate with other agencies of government on the proposed project for the transformation of Papine into a University town. The UDC and UTech, Jamaica Caribbean School of Architecture (CSA) have collaborated on a number of architecture projects. Arch. Jacquiann Lawton, Head, CSA outlined that these have included a National Music Museum (2013), the Maxfield Children’s Home & Therapeutic Centre (2014), The National Sport Museum of Jamaica (2015) and The Simon Bolivar Annex-Music Incubator (2017). The UDC is the principal public sector organisation responsible for planning and designing urban environments in designated areas in Jamaica. It is also the entity charged with preparing, developing and implementing plans for urban development, urban renewal and rural modernization in collaboration with other agencies. Prof. Stephen Vasciannie, CD, (3rd left)President, University of Technology, Jamaica and Dr. Damion Graham (4th left), Chief Executive Officer, Urban Development Cooperation (UDC) display a copy of the signed Memorandum of Understanding between both entities following a signing ceremony held on Monday, February 12, 2018 at the University’s Papine campus. Sharing in the occasion (from left) Arch. Jacquiann Lawton, Head, Caribbean School of Architecture, UTech, Ja., Dr. Garfield Young, Dean, Faculty of The Built Environment, UTech, Ja. and Richard Picart, Senior Architect, UDC.